Getting married is great, but weddings are notoriously expensive, and not everyone has the means to jet-set to some romantic hinterland for a honeymoon. So why not cut your losses and elope on a Megabus? The company is seeking to award a couple with a free wedding, and two-roundtrip tickets as transportation for a honeymoon as part of its “Mary Me on a Megabus” sweepstakes. Oh yeah, and the winners will also receive $2,500 cash to spend on whatever it is hedonistic newlyweds like to do. Sean Hughes, Megabus's director of public affairs, claims that many lovebirds-in-transit have met on the company’s buses. "Over the past 10 years, we have loved hearing about couples that have met on a Megabus or used megabus.com to travel to see their long-distance loves," he said in a statement. 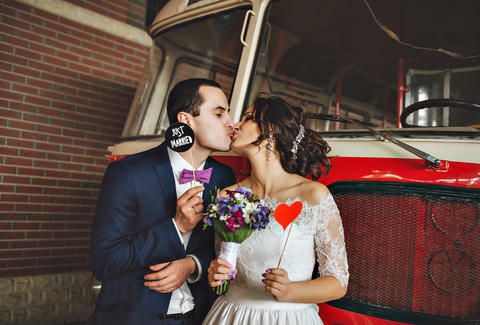 If the wheels aren't already turning in your brain, dig this statistic: The average cost of getting married in the United States is $26,645, according to The Wedding Report, a research firm that tracks trends in the wedding industry. So if this sounds like a viable alternative to going broke over a dream-wedding, applicants have until February 21 to enter the competition, and can do so by following instructions on the company’s Facebook page or through an online forum. Megabus will gladly pay for flowers, music and anyone qualified to preside over the festivities -- like a priest, rabbi or your mother's cousins podiatrist, if that's your speed. Elvis impersonators should work, too. So if you're looking to save your money on some real romance, the engines of marriage have probably never sounded sweeter and less expensive.